One of our referees, Alan Graham, has suffered a stroke and is currently in hospital. We have had many messages for his full and speedy recovery from fellow referees, clubs and players and we at the GMWF League endorse those wishes. It’s at times like this when sport becomes irrelevant and hopefully we will see Alan back officiating in the Autumn season. Apparently Alan has been discharged from hospital and is now back home and doing well. Thanks to all the clubs and individuals who sent their best wishes messages for Alan. These are being collated and will be passed on shortly. Adam Waterhouse, a student at Manchester Metropolitan University needed to create an audio documentary as part of his course. His subject was walking football and how it had changed the lives of the older generation. Adam recently visited Heywood Sports Village to interview players, the results can be heard below. Here’s the video of the ARD German TV coverage of our final session of the Greater Manchester Over 60’s Walking Football Autumn League in December 2017. Unfortunately most of the commentary is in German. The Greater Manchester Walking Football League was launched initially in November 2016 to provide regular competitive football for the many over 60’s walking footballers. Players in their 60’s and 70’s are often giving away 10 years or more to younger players in normal over 50’s competitions and this doesn’t create a level playing field. Generally the younger players are fitter, more energetic, have better balance, are less likely to have replacement hips and knees, don’t suffer as many injuries and recover quicker when they are injured. With Greater Manchester having the most walking football clubs in any area of the UK, and the sport being the fastest growing activity for the older generation, setting up a league in the area was a natural progression. 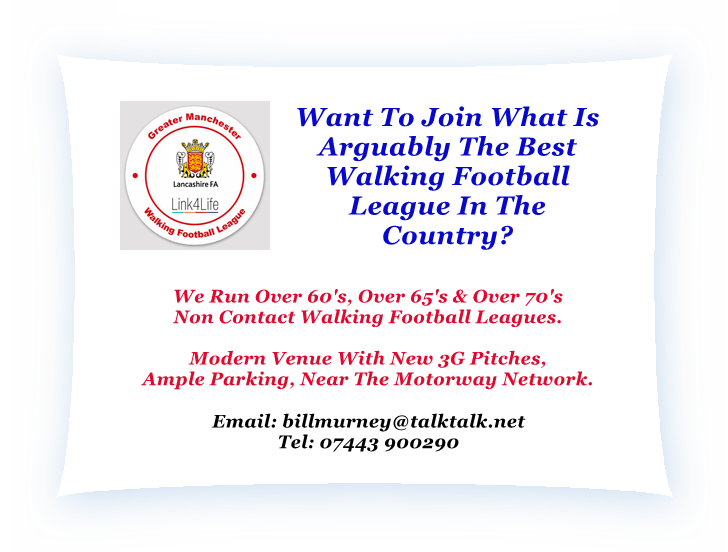 Seeing the demand for this category of walking football, I decided to enquire if teams were interested in playing in an over 60’s league format. The response was encouraging and the first to embrace the idea was Paul Gardner of Rochdale Link4Life. Paul is now the co-administrator of the league and his colleague Barry Woodburn is responsible for team registration on tournament and league fixture dates. Andrew Whitaker, the Football Development Officer – Disability and Inclusion, from the Lancashire FA has also been a great help in getting the Greater Manchester Walking Football League affiliated and sanctioned to that organisation. Thanks Andrew. The league has been developed to provide a regular opportunity for teams across Greater Manchester, Lancashire and its bordering counties to compete in sporting competition and enjoy great social inter action. The Greater Manchester Walking Football League runs in seasons, Spring and Autumn, with each season consisting of 4 monthly fixture dates. All fixture dates take place on the new 3G facility at Heywood Sports Village, West Starkey Street, Heywood, OL10 4TW. Further innovation came in the form of an over 65’s League, which was introduced in February 2018, where seven teams entered the inaugural division. In the same year two over 70’s Cup Tournaments were introduced, probably the first in the country. We started an over 70’s League in March 2019, with seven teams competing, the first over 70’s league in the country. Next up will be an over 75’s Cup Tournament, as the present teams move up the age category. A big vote of thanks is given to all the teams who entered the initial league season started in February 2017, AFC Blackpool Senior Seasiders, AFC Blackpool Very Senior Seasiders, Bolton Wanderers, Chadderton FC WF, Fleetwood Town Flyers, Maccabi Old Codgers, Nash Amblers, Rochdale Striders, Rochdale AFC Strollers and Vintage Celtic. We hope you are all convinced you made the right decision in being inaugural members of the league, have enjoyed the competition, and of course, will return for future seasons. The league has a growing reputation as one of the best in the country, with many teams saying it’s the best organised league they have played in, with excellent referees, a great modern venue and it’s close distance from the motorway network. If your team would like to join us then please either use the Contact Us page or phone 07443 900290. If you have no particular team of your own to play for and would like to be involved, sometimes our current teams are short of players. If you would like to go on the spare players register then please use the contact details above.